If you’re a fan of history and mystique then Boku Slots have a great game for you to try. 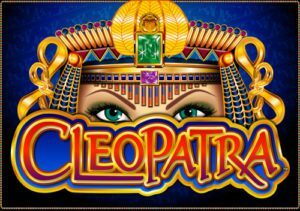 IGT Slots (Wagerworks) have taken the iconic Cleopatra and created a slot, which has become as iconic as the Egyptian queen herself. Let us take you back to the times of pyramids, sphinxes and scarab beetles. Combining colourful graphics and an interesting sound track, which includes Cleopatra herself speaking. This game really does create a certain intrigue even before you begin to spin those reels. With Cleopatra slots you will be playing across 5 reels and have up to 20 pay lines available. The limited pay lines shouldn’t put you off though, as this just means there is a better chance of those winning combinations dropping in. On top of this it has an impressive RTP of 95.02%, meaning your chances of hitting a winning combo are slightly higher when compared to other slots. Bet Amounts – Betting with Cleopatra begins at £1 per line, with a maximum to £200 per line. You can of course increase or decrease the amount of pay lines in play, in order to adjust your stake per spin to suit your budget. Wilds – Your wild symbol is non-other than Cleopatra herself, so if you are lucky enough to land one or more then you will complete any possible winning combination. When Cleo lands she will change to the word double and your winnings will be multiplied x2. 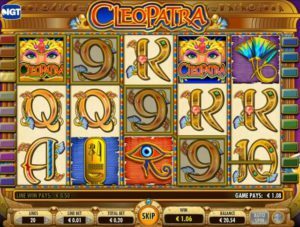 If you land 5 x Cleopatra symbols on an enabled pay line, you will win the jackpot of 10,000 coins! Scatter – The scatter symbol is the golden sphinx, if you land three or more you will launch the Cleopatra slots bonus game. If you land 5 scatter symbols this will award you with a win of 100x your stake amount. Cleopatra Bonus Game – After landing three scatter symbols the bonus game will launch. You will receive 15 spins and all wins during the bonus are x3. Also, if you land 3 or more scatter symbols at one time during your bonus round, then you will be awarded with yet more spins. Other Symbols – There are a mix of symbols ranging from alphabetical and numeric icons, as well as hieroglyphs. Each of the symbols are ornate in design and very eye catching too, which makes for pleasing game play. The lower value symbols are your 9, 10, J, Q, K and A. The higher value hieroglyphs come in the form of the Eye of Horus, Scarab beetle, Sphinx (scatter) and of course the lovely Cleopatra (wild). Cleopatra slots is fantastic in as much as it is an older game, which has been revamped many times. However, with its Egyptian themed symbols and almost classic soundtrack, we still love this game just as much as when it was first released. Especially because it has transformed from a machine based slot, graduating to an online slot almost effortlessly. We look forward to playing this game for years to come.